Sixteen-year-old Morgan Punchard went over from half way against Castleford Panthers to become the youngest-ever player to score a try in a Lock Lane first-team match. Picture: Matthew Merrick. National Conference League teams Castleford Panthers and Lock Lane went head to head on Saturday in the annual memorial game in memory of club stalwarts Brian Lloyd (Panthers) and Dave Arundel (Lock Lane). In lovely weather, the game was watched by its biggest ever crowd. The match was played in great spirit and was entertaining throughout. Premier Division Lock Lane started strongly and opened up an early lead through two tries from winger Connor Turner. Division Two Panthers raised their game to get back in the arm wrestle mid way through the first half, but Lock Lane scored a couple more tries before the break. The second half saw Lane’s attack again prove too strong as they posted several more tries. Panthers got a consolation late on as Lock Lane ran out 56-16 winners. Lock Lane head coach Paul Couch said: “The memorial game is something that both sides always look forward to. “It’s was a great day and spectacle for the huge crowd in attendance on Saturday. Featherstone Lions under 17s battled hard in a 44-18 defeat against derby rivals Lock Lane. Featherstone started the game as usual with only 12 players and were always going to struggle against a well drilled Lock Lane outfit who were at full strength. However, Lions made the better start, putting Lock Lane on the back foot in the early stages. After a powerful run from Connor Morse, Jack Townend forced a drop out with a clever kick into the in-goal area. From the restart, the strong running Lions man of the match Sam Whitehead forced his way up to the visitors’ line before off loading to Jack Carter who passed the ball to Ryan Lister for him to to jink his way over for the first try which was converted by Jacob Jowett. Lock Lane showed renewed determination in response to Featherstone’s good start. Linking well Lane made good ground and they capitalised on basic mistakes by Featherstone to score three quick tries, two of which were converted. Lions dug deep and struck back shortly before half-time. Brad Simpson started swift passing along the line which led to Jack Lloyd scoring an unconverted try. On the stroke of half time, Lions made another basic error which was punished when Lane grabbed a converted try. The second half started with Lock Lane tearing through the Lions defence to score another well taken converted try and the game looked over. Featherstone had one last flurry to try to get back into the game with Townend playing a major role. Townend’s long pass to Dawson almost led to a try. His clever kick then resulted in a touchdown for Ryan Dawson before his neat off-load in the tackle led to Jowett scoring a try in the corner. 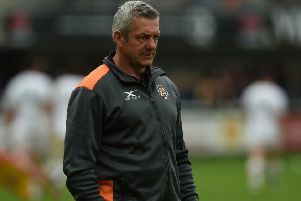 Lions were only a couple of tries behind and pressing hard when a disputed knock on near the Lane line saw them retrieve the ball and go the length of the field to score. Feathertone, who had tried hard to match the skill and power of Lock Lane, were now tiring and started to lose their discipline as decisions went against them. Lane took advantage and put them to the sword with two more converted tries in the closing stages to run out comfortable winners. Featherstone were no match for Lock Lane on the day and the Castleford side were worthy winners but Lions fought hard to make a game of it.